One of the Sons of Union Veterans of the Civil War many goals and purposes is to reward young men who achieve the status of Eagle Scout with a special congratulatory letter and color Certificate of Commendation, suitable for framing. While we encourage any young man searching for that special community service project to look to us for inspiration on projects relating to the Civil War, we offer this certificate with no “strings attached” other than you must be an Eagle. Your Eagle Court of Honor observes a very proud tradition that our organization is pleased to recognize in memory of the Grand Army of the Republic (GAR). Comprised of over 400,000 Union Veterans of the American Civil War of 1861-1865, the GAR was a living symbol of patriotism when the Boy Scouts of America was formed in 1910. Before the passing of their last member (on 2 August 1956) the GAR officially recognized the Sons of Union Veterans of the Civil War (SUVCW) as their Legal Heir. As such, it is our honor to maintain the many traditions of the GAR. These include the promotion of good citizenship by teaching patriotism, civic duties, and the love & honor of our flag – concepts that are “near and dear” to the Boy Scouts of America. 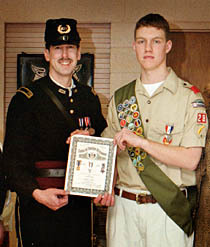 When possible, every effort is made by Camp (local chapter) and Department (state) members to present the certificate to the Scout at his Court of Honor, usually wearing the uniform of our Order or a replica Civil War uniform. Note: A personal presentation is not possible when ordering through the National Coordinator. Click here for a listing of Department Eagle Scout Certificate Coordinators, organized by state. Download this certificate application (pdf). This application must be completely printed on line. We recommend you keep a copy for your records. You may also keep an electronic copy by saving the completed form to your computer. You must use a different file name in order to preserve your entries. NO hand written forms, letters or cards will be accepted. We prefer that the application be sent as an email attachment. Email the application to the Department Eagle Scout Coordinator and request that the application be sent to the appropriate coordinator within your department. A 45 day notice is required to have a presenter at the Court of Honor. Postal mail applications will not be accepted. Note: These guidelines must be followed in order to receive a certificate. If these guidelines are not followed a certificate may not be sent.